When I started out in the industry the lifestyle suited a young teenage lad fresh from his mother’s home. It was the late hours, adrenalin still pumping that led to drinking, smoking and partying into the wee sma’ hours. Throw in eating at odd hours and grazing all day long, tasting and preparing and you will quickly begin to realise why there are so many burnt out sous chefs in their 30s. Sweeping generalisation I know, but it is one of the downsides of a life in the kitchen. 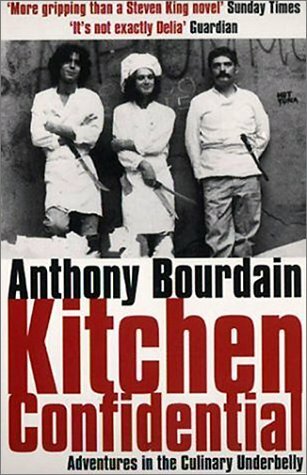 Have a read of Anthony Bourdin’s brilliant Kitchen Confidential if you’d like a darker look at this. I knew it would be easy to make bad choices and blame the industry. I could see chefs that were tired and fed up with it all and I didn’t want to go there. I believed that if you fuelled your body well then you’d fuel your passion and keep it going. Don’t get me wrong, you need to let go occasionally but the irony of the chef that doesn’t eat well and leads as unhealthy a life as you’ll find wasn’t lost on me. So I looked around and found the flip side of all of this. And the flip side is that you channel this extreme nature that you’ve cultivated into something bigger. 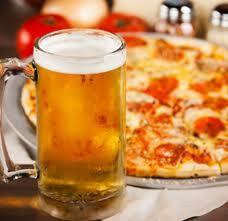 Enjoy a beer like the rest of civilisation and take up another hobby that will let you spew your crazy out. For me, I needed something that would blow away the cobwebs and let me prepare myself for 14 hour shifts – not annihilate my body into thinking it never wanted to stand upright again! So I ran. I ran a lot in my teens, left it and then as the industry got hold of me I knew that I had to do something other than drink beer and eat pizza at midnight. I have to tell you, the last thing you feel like doing at the end of 14 hours in the kitchen is pull on your trainers and start running. But once you’re out there, doing it, there is nothing better. Which brings me neatly back to where I started – a chef’s mindset is one of perfection and 100% effort. Failure is not acceptable. So instead of running around the block a few times I started to try marathons. Training, I looked like a demonic chef in running shoes. My obsessive personality not only made the whole thing possible, it made it almost essential. This type of behaviour is almost as common in the industry as middle aged chefs with middle aged spread – it’s just the other side of the coin. Look at the famous faces of Gordon Ramsay and Michel Roux Jnr who both run marathons. Off celebrity, local Michelin Star chef, Andrew Fairlie recently climbed Kilimanjaro – you don’t do that on a two week holiday. 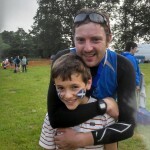 I trained and competed with one Greig Farmer – my best friend of 17 years. Greig’s a policeman and a swimmer / cyclist. I’m a runner. We have been out in all weathers, training hard and improving at every turn. My swimming probably needed most attention – when I started I couldn’t go more than three lengths front crawl without retching. 3 months in I was doing 100 lengths. 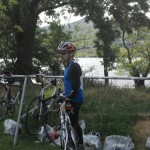 This event was more than sporting for me; I was retraining a runner’s body. I started cycling and forgot my feet were attached to the pedals. There were more than a couple of near misses with junctions and cars and me with my feet still attached to the bike. Coming downhill thinking “if I come off this damn thing I’m dead” is more stupidity than fear to start with! The Day of The Race arrived. It was hot, damn hot. This glorious weather and unprecedented summer of 2013 shone down on Greig and I and didn’t let up. We had trained in all weathers but this was something else. The night before, we camped out on the lochside in a tiny tent watching the experienced guys walking around, pumped up and hulk like. Tanned and oiled and looking like they belonged in a gym my puny runner’s body “built for speed” seemed a bit inadequate. They were putting up four storey tents and Greg and I were unpacking our canvas tesco carrier with our confidence in the bottom of our trainers. At 6am the next day we were assessed on map reading and run through a checklist of our backpacks (there are 10 – 15 MUST HAVE items in there including a head torch and body blanket). We’d had about 3 or 4 hours sleep and as we climbed onto to the big stage for the warm up the realisation of what I was doing sunk in. 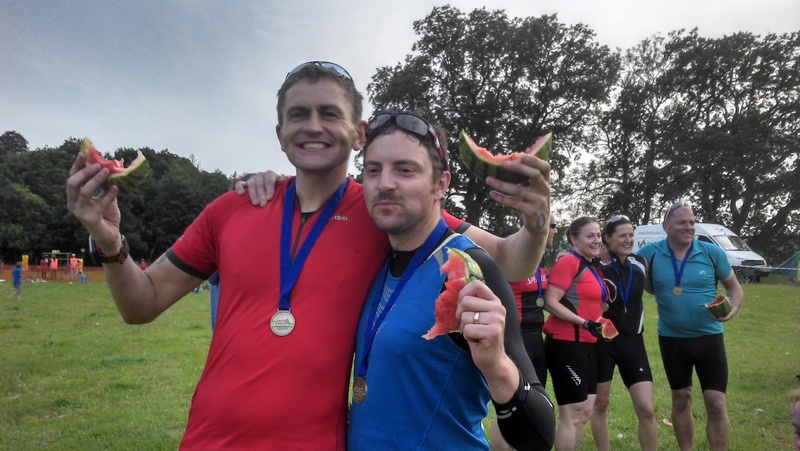 The 400 strong participant group was split into two and as I ran in my wet suit to the side of Loch Tay being piped into the water with 199 complete strangers, all I could think of was “I hope I’ve done enough”. 5,4,3,2,1! 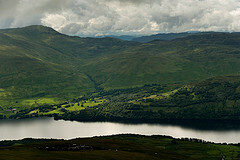 The piper was in a boat, piping us over the Loch but I kept my swimming head on, ear plugs in and went for it. 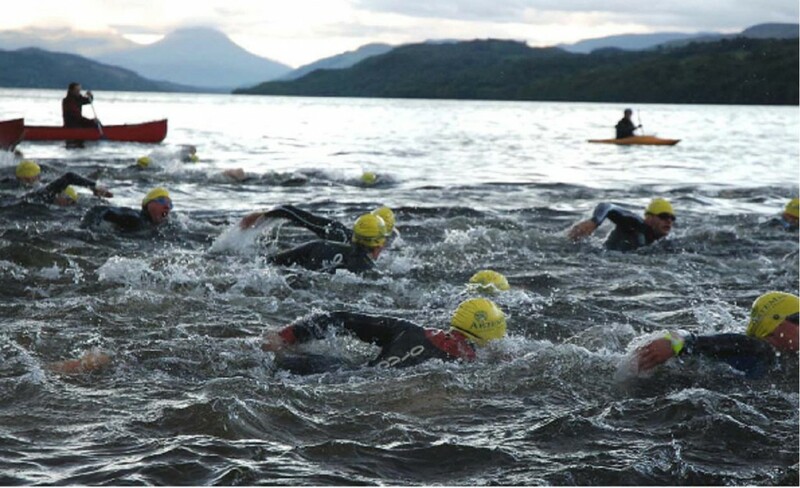 One mile in open water in Scotland is quite a task let me tell you. We staggered out the other side and after some chocolate cake and juice to fuel us it was on with the running. 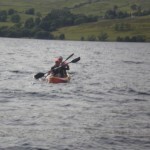 I do need to admit to a heinous crime here – I hadn’t screwed my water tight enough and it spilled all over Greig’s gear – he came out of the Loch, stripped off his wet suit and then started the run in wet clothes. All thanks to yours truly. I don’t think we’re there – but you get the jist! We made a personal best on the first 6 Munroes, running them in just about four hours. You were chipped and had to clock in at the top of each mountain where there were doctors to check you were ok. We approached the last Munroe and stopped for cheese sandwiches and soup. The heat was incredible; we were in mid-day sunshine by this point and that final climb was bloody vertical. 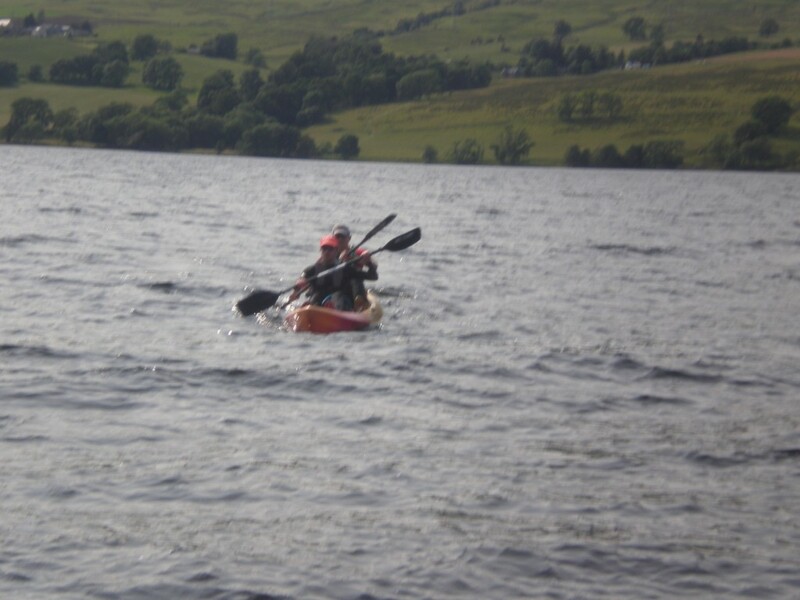 Very tough, we took one and half hours to get over and although it was fast coming down we discovered at the bottom that there was another three miles to the lochside and kayak stage. 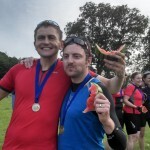 Now, I’m not proud of this next statement but as I was running in a blur of nausea and dizziness I threw a strop… “No-one told us there was another 3 miles – they should’ve bloody told us…” Not my finest moment. But as we turned the corner to the lochside there was an almighty cheer – a crowd had gathered. The feeling of camaraderie that this brought was so strong it drove out the sickness and gave us a much needed boost. We climbed into life jackets and into the kayak, me in the front and Greg in the back. This was the stage we’d trained for least – what a school boy error that was. My legs seized up and my shoulders were killing me. This is where all those years of friendship kicked in. I knew I couldn’t let him down, he knew he couldn’t let me down and so we put our backs into it and got across the Loch in 1 hour 45 minutes. As we staggered out of the kayak at the other side we could barely walk. We could see our wives and kids smiling and waving and my heart went. Never, in all my years of marriage have I wanted so much to run up to Fiona, curl up in a ball at her feet and have her hug me. It was terrible. I literally felt like I had nothing left. I have never dug so deep as I did at that point. 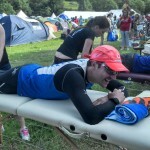 Steven Bonthrone, the PT who trained us, told us that we’d discover things about ourselves during the race. I didn’t really understand what he meant until that minute, looking at Fiona and feeling like I’d bottomed out. The crowds were lined up and it started downhill from Killin to Kenmore with BIG speed. There were cheers going up as we turned the corner and a sign that said 7 miles to go. My head was screaming “STOP YOU FOOL” but as I pushed through the mental barriers and onto the finish line the adrenalin pumping through me built again. We parked the bikes and ran the 200 meters to the finish, breathing hard and laughing as we crossed the line. We were handed a claymore to split a watermelon at the end and stop our clock. I have to say our chopping effort was poor at best. I walked like the tin man to the massage tent and was handed a ticket to wait my turn – I had to be lowered into a seat and as I couldn’t bend to take my leggings off a very nice girl helped me out of them whilst being treated to what sounded like a drunken, giddy apology. I don’t often do this but I MUST give a huge thanks to Wildfox events for superb organisation. There were loads of activities for the kids, volunteers on the mountains and in boats, second to none safety and a bloody brilliant after party. If it wasn’t for the bit in the middle it would have been a great weekend out! Thanks to Steven Bonthrone for his great advice and training. 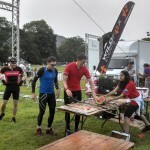 Much respect to Greig for being my friend, partner and for not killing me at wet kit stage. Me and Greig – What a Mate! The Bike Was Holding Me Up! Ethan Had A Hug For His Dad! The Smell Was Too Much! Last but not least my neverending thanks to my wife Fiona and my kids – this level of training and my dedication to my kitchen isn’t the easiest thing to fit into family life but they have supported me, as they always do, throughout. It’s been an amazing year for me, one I’ll never forget. But I know I would never have been picking up Scottish Chef of the Year Title, scaling mountains or feebly chopping clock stopping watermelons without all three of them right there by my side. I am a fortunate man indeed.